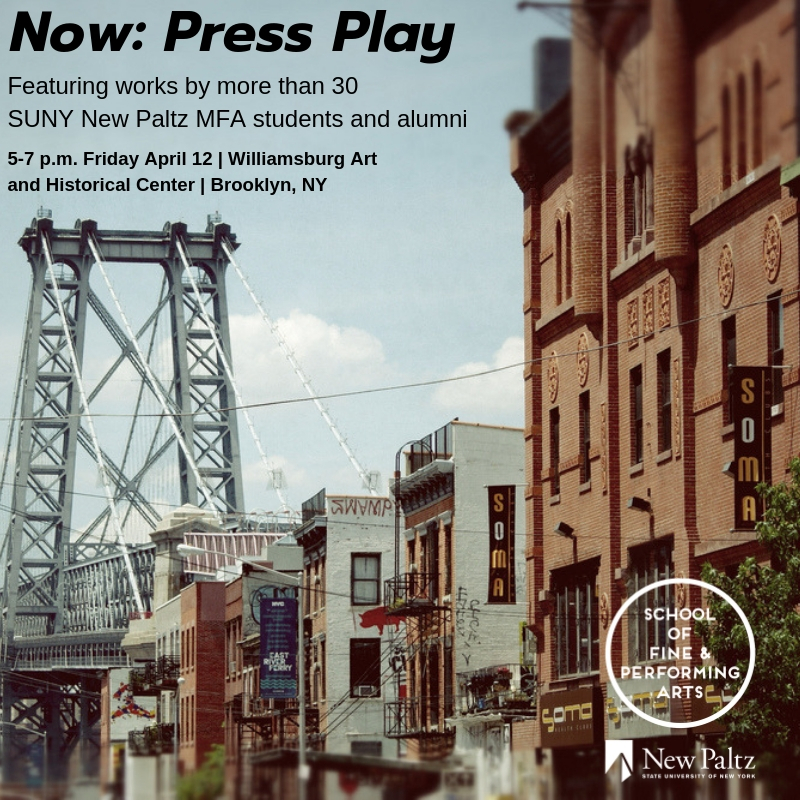 The Department of Art and the School of Fine & Performing Arts at SUNY New Paltz announce “Now: Press Play,” a juried exhibition of works by Master of Fine Arts students and alumni, at the Williamsburg Art and Historical Center in the art center of Brooklyn, New York. All are welcome to attend the opening reception for “Now: Press Play,” Friday, April 12, from 5 – 7 p.m. at the Williamsburg Art & Historical Center, 135 Broadway at the corner of Bedford near the Williamsburg Bridge, Brooklyn, New York. The exhibition will remain on view through Saturday, May 4. The exhibition is curated by Glenn Adamson, senior scholar at the Yale Center for British Art and previously the director of the Museum of Arts and Design NYC and head of research at the Victoria Albert Museum in London. Participating New Paltz MFA students and alumni are Sylvie Alusitz ’19g, Julia Arvay ’19g, Geoffrey Booras ’13g, Emily Brownawell ’19g, Hyein Cho ’17g, Min Jae Eom ’20g, Reed Fagan ’16g, Mary Beth Fiorentino ’18g, Jessica Gaddis ’18g, Stefan Gougherty ’20g, Bryan Hale ’19g, Tamar Hedges ’19g, Amanda Heidel ’19g, John Huckins ’14g, Julianne Hunter ’17g, Karen Jaimes ’20g, Benjamin Kellogg ’18g, Bora Kim ’10g, Geuryung Lee ’19g, Betsy Lewis ’19g, Ruizhi Li ’19g, Katy Itter ’15g, Lydia Martin ’17g, Megumi Naganoma ’19g, Emily Nomer ’17g, Michal Ozeri ’17g, Sariah Park ’20g, MengNan Qu ’15g, Jennifer O’Connell Reid ’18g, Heather Rosenbach ’19g, Nick Rouke ’20g, Jolynn Santiago ’19g, Andrew Sartorius ’19g, Jamie Scherzer ’20g, Sharon Strauss ’19g, Bruce Wahl ’20g, Kehan Wan ’20g, Hannah Ward ’18g, and Xuewu Zheng ’20g. Visit SUNY New Paltz for additional information about Master of Fine Arts programs in the heart of the Hudson Valley. Learn more about “Now: Press Play” on the Facebook event page.